I cut a 2X4 the width of the frame rails and wiggled the board into place and lowered car onto jacks supporting 2X4. I unbolted muffler and let hang first. 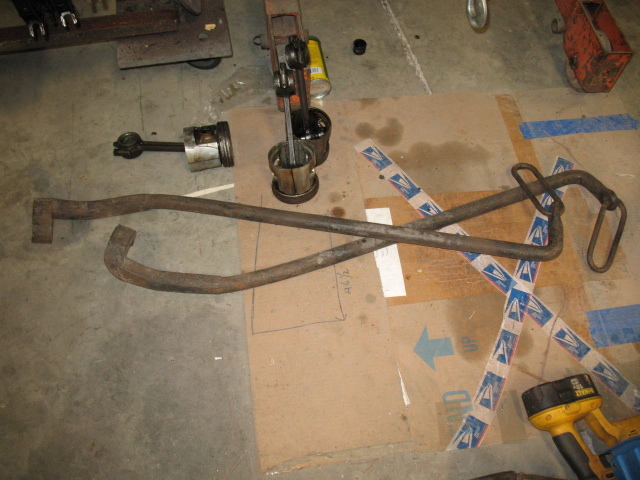 Then jack up your axel support bar, to loosen drive shaft bolts and axel hanger bolts. The steel tubing's wall thickness must also be considered! I am not sure what the minimum wall thickness should be. A 1 1/2 square would work fine? HOWEVER, the wall thickness would have to be at least half again thicker than the 2 inch square tubing. That may be much more difficult to get and likely more expensive (more total weight) if purchased through normal steel supply channels. Square tubing comes in several common wall thicknesses. BE SAFE! Make sure everything is strong enough, and securely blocked, and stable. Why do you want to go to 1.5"? Having 2" .125" wall box tubing is more than adequate to support a T. Quite frankly, 1.5" .125" wall tubing still would probably work , but why take a chance? 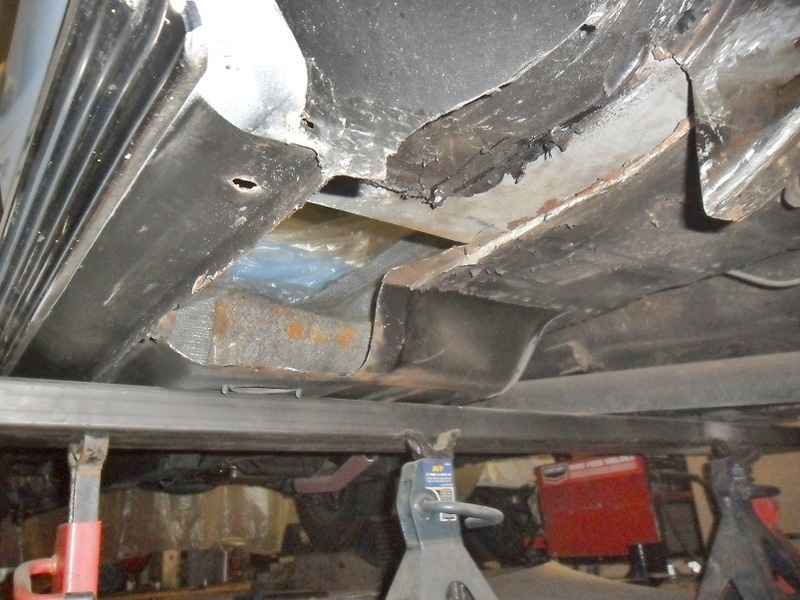 This past year I used a piece of 2x8" .125 wall tubing on the wide side to support the back half of a 66 Mustang under each rocker panel while I replaced the rear frame rails. 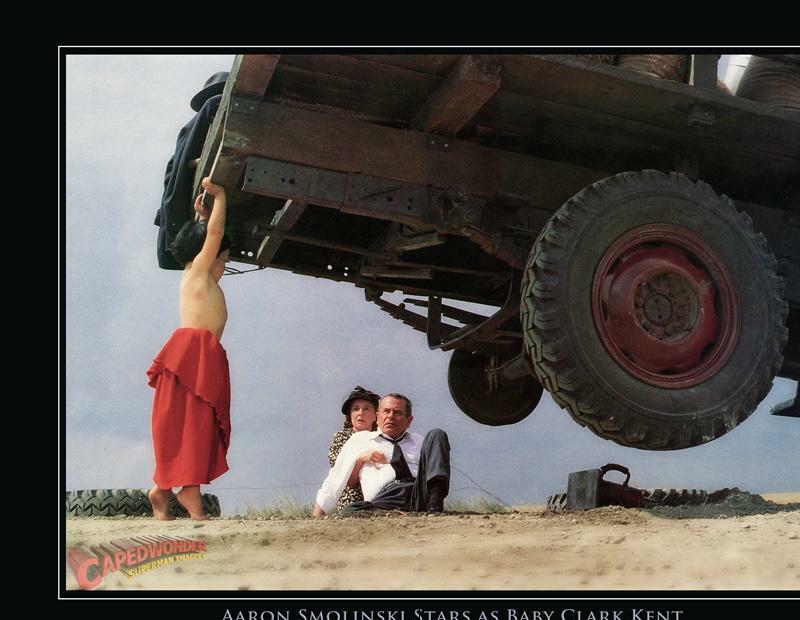 It was sturdy, but you could see it bow just a little under the weight of the car. 1 1/2" .188" wall should be adequate. .250" wall is overkill IMO--and heavier--but safer too, and .125" wall "probably" would work, but I wouldn't be surprised to see it flex quite a bit over a 6' length. I really feel 2" is the way to go and I would not have any issues using that in a lighter .125" wall thickness. It really isn't that heavy for a piece that size. The piece I use is 2" x 6' and 3/16". I find six feet plenty long enough. Overkill? Would a lighter gauge work as well? Maybe so. It's what I happened to have and it's solid as a rock. I made my stands with 2.5"channel on top so there's no chance of the tubing sliding off. I don't like the idea of ordinary jack stands underneath with nothing to hold the sides of the tubing. I can imagine that tubing sliding off with very disappointing results. I'm with Steve. Why mess with something that "might work" when you are betting your life on it ? Since you aren't doing any serious calculations or testing, you should want a huge safety margin. With a simple calculator, I can tell you that a piece of 2" square tubing is approximately 2.5 times stronger than a piece of similar wall 1 1/2". With the smaller size, you are only saving 25% in weight and cost, but sacrificing more than half in strength. Not a good trade-off to me. A word of caution. 2X2 industrial tubing is slippery against the T frame. Be sure to chalk the front wheels or the car will slide forward on the square tube. I use Steve's system also and it works well. I would stick with 2X2 square, not the the 1 1/2" stuff. 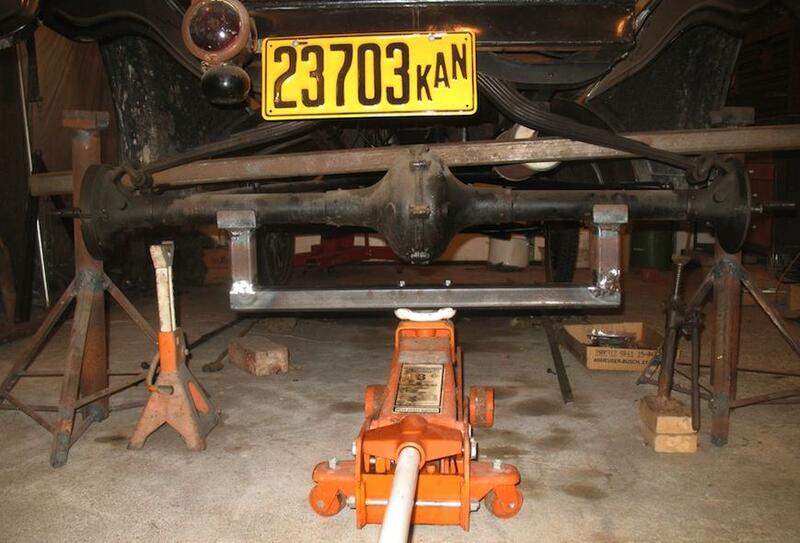 To get high enough, you will need heavy (truck) jack-stands ...unless you can make some like Steve did. All my life I've jacked on the pumpkin, is that a no no? 2 jack stands placed on the frame rails just ahead of the parking brake rods works perfectly fine for supporting the T and is safer than these contraptions. The axle can be supported by the floor jack which can also be used to side the axle assembly under or out from under the car. Things bolted to jacks change the center of gravity of those devices and also change the load on parts that were not engineered for that purpose. Hal, with as little as the rear of a T weighs, I always jack the rear up in the center. I've changed many rear ends using Kenny's method. It works on all body styles I've tried, including Centerdoors. Some folks worry that jacking a T from the pumpkin will bend the housings. I have found no evidence of this, at least not with 1916 and later rear ends. I have tried to bend T axle housings (in an attempt to straighten them) by putting them individually into a press and visibly bending the tube. They tend to spring back to their original position within a day or so. The only really effective way I've found to bend T axle housings, is with heat. Steve, how high are those stands? Most of the time you can guess what size of structural member is needed but sometimes it is good to put pencil to paper. In this case a 2" x 2" x 3/16" tubing should work fine with an adequate factor of safety. Jim, you have to explain your calculations. I see that you are calculating the momment of one of the 500# (Car weight). Why don't you consider both forces of the car weight? In the Section Modulus, what is Fb? The Required (S) is 0.568, but why is that inch cubed? How did you figure the S=0.640 inch cubed? I don't understand why you would not just stick the jack stands directly under the frame? It would save a bunch of work and be safer too. 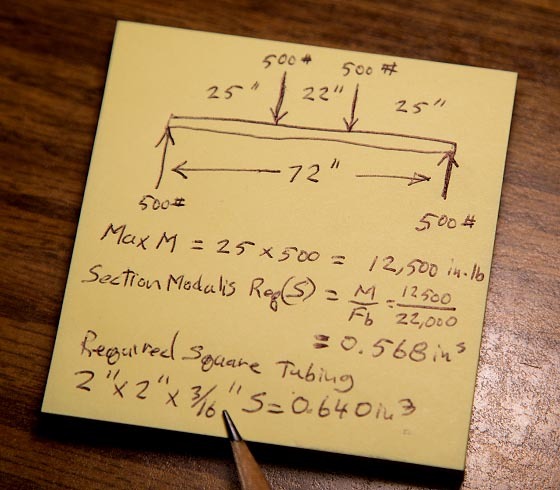 Jim, I looked up Sectional Modulus and found a formula for a 2x2x3/16 square tube. Is that how you got the 0.640? I'm with Kenny and Tom. 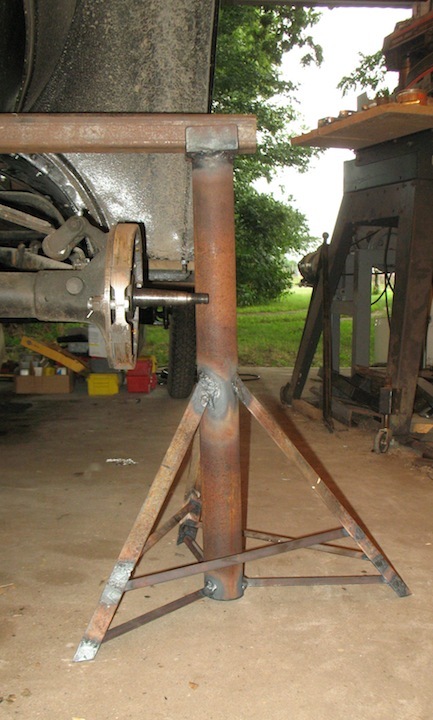 For many years and many cars I have always just put two jackstands on the frame as far back as possible. If you keep the frame fairly level there is no worry of the frame sliding on the stands. Blocking the front wheels is still a good idea, although I never do. Due to the shape of the axle housings the metal would have to stretch in order to bend an axle housing by jacking the car up in the center. If want safety overkill then first remove the body before removing the rear end. 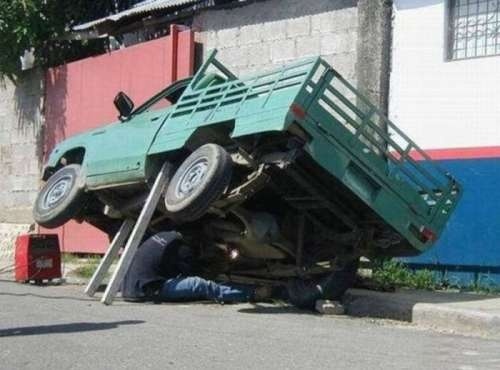 Mike, if the car was teetering, the jack stands are too far forward. If they are as far back as they can go, the radius rods will clear and the car won't teeter, at least it never has with me and I've changed dozens of rear-ends. In the time I've spent looking at this thread and typing, I'm sure I could have changed a couple of rear ends. It only takes a half hour or so depending on how easily the wheels come off. A touting with a lot of junk under the rear seat will tend to teeter until you get the rear hubs and wheels off. As sack of sand or anything else placed on the front benders near the hood will cure that problem. I've put the rear cushion on the cowl and all the parts and tools from under it on the floor to get the extra weight off the rear. 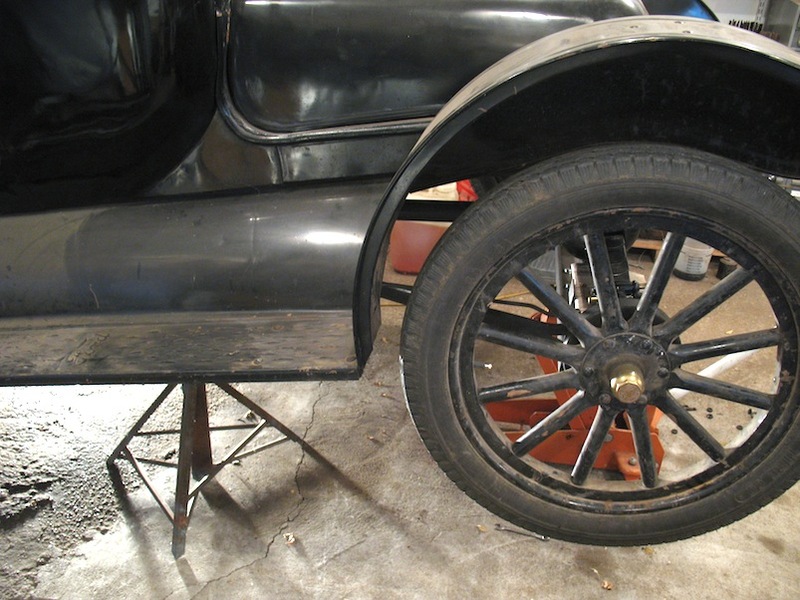 I've only used jack stands to remove the diff of a Model T. Place them on the frame rails as far back as they can go(typically resting against the radius rods). I've experienced no teetering, I've swapped a diff when there is no engine installed using this same method and the chassis was steady as a rock. I've done it this way with coupes, roadsters, touring cars, speedsters, depot hacks, center doors and everyone was stable. I recommend not making this process more work than is already required. M = Bending moment with the beam under load, maximum at point of loading. 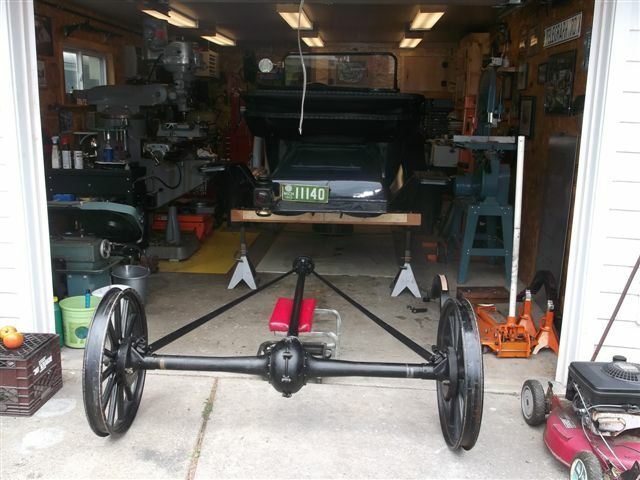 I used the maximum weight of the car as 1000lb, that is 500lbs on each frame channel. Probably would be less but would take into consideration if someone placed the support beam more toward the front of the car. Wow! Those are a lot better ideas than the Milk Crates I used. Milk Crates! I hope no one is using those cement blocks, They're the real killers. by a falling T-Bird he had set on those cinder blocks, causing a sudden loss of interest in old cars. 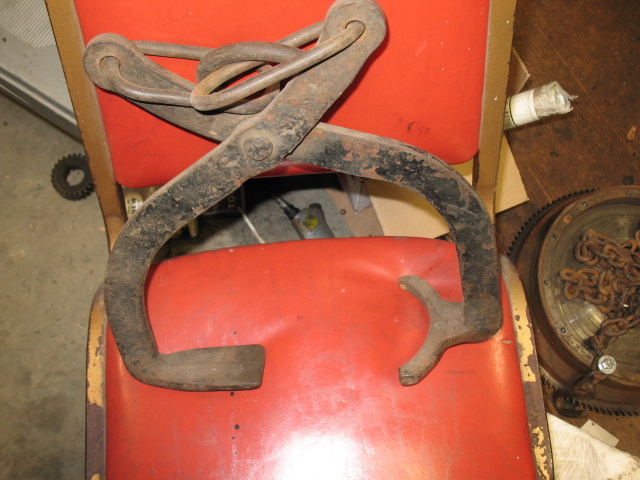 get this job done, whether you are working on a Model T or a T-Bird. Why Rube Goldberg this ? Thank you Gene! I usually add my "safety alert" to threads such as this one and you beat me to it. Please listen to Gene's warning about cement blocks. I lost a friend years ago who was working under a vehicle supported by cement blocks that crumbled as they can (and do) and he was crushed to death! Oops! Should have said thanks to you too Mr. Burger! Those darn cinder blocks are heavy and therefore, might seem strong, but they really crumble easily. They are meant for one purpose only,....to be stacked squarely upon one another to build a wall,.....AND NOTHING ELSE! I just re-read my earlier post and I meant to have said radius rods. 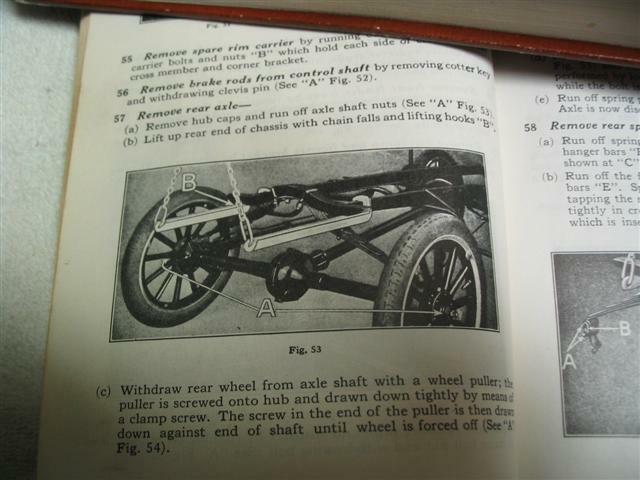 Don't know why I typed brake rods? The stands on the frame rails just in front of the radius rods work perfect. It don't get any simpler than that. I have used the jack stands also (15 touring). Did a little pushing and lifting on the car before crawling under. Rock stable. Simple and works well. 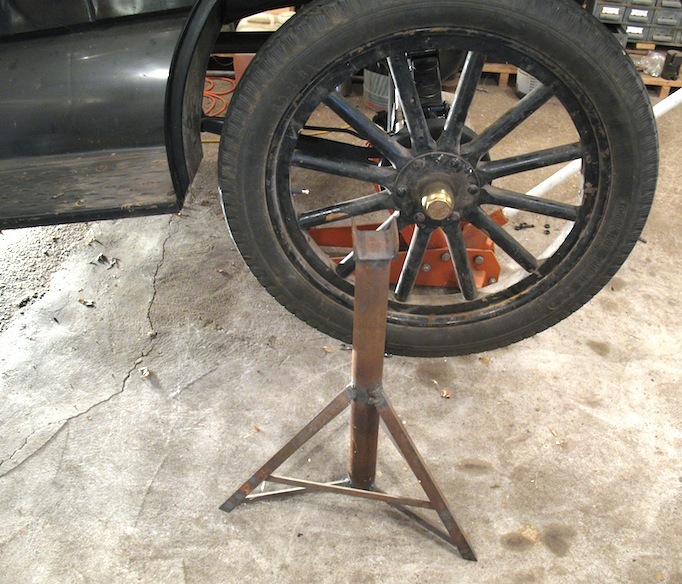 After reading about putting jack stands under the frame ahead of the radius rods, I jacked up a car to try it. I guess it will work, but I think I prefer having the support farther from the center of gravity. I believe I'll stick with the tubing between the muffler and rear spring. 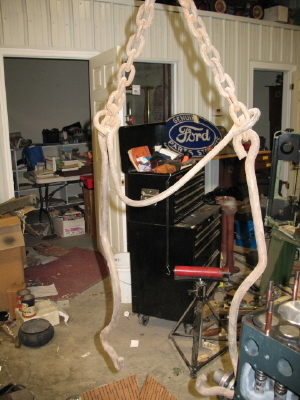 The easy way is make a set of lifting hooks for the frame at the back end, and then you have nothing in the way underneath to get in the way. 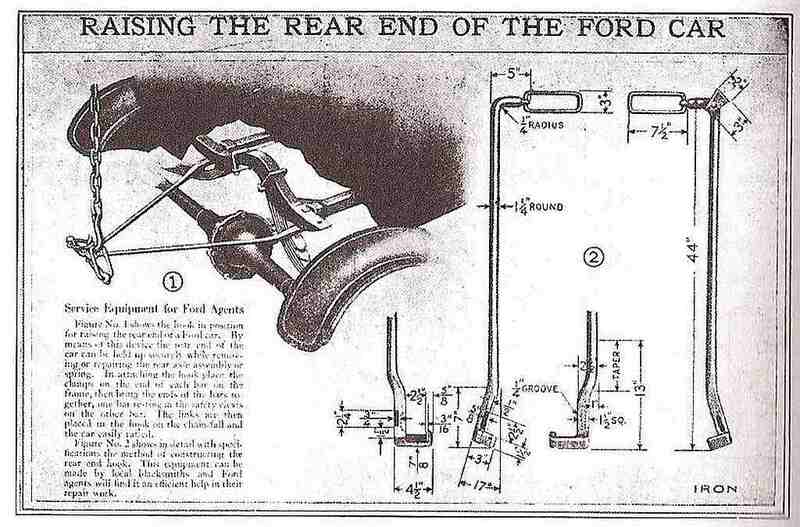 When I was 19, I copied a set out of the Ford service sheets, and like out of the Ford Service book for my center door sedan at that time, on Page 16, Figure 54. Herm - Could you or are you willing to make these up and sell them? Just don't have the time, as we Babbitt every day. Anyone can make these Keith. I could give you the Dimensions, but I loaned them to a friend a while back. When I get them back, I will post the Dimensions. The hook part is easy. It goes up the out side of the frame, bends over the width of the top of the frame, and then bends straight down about an inch. 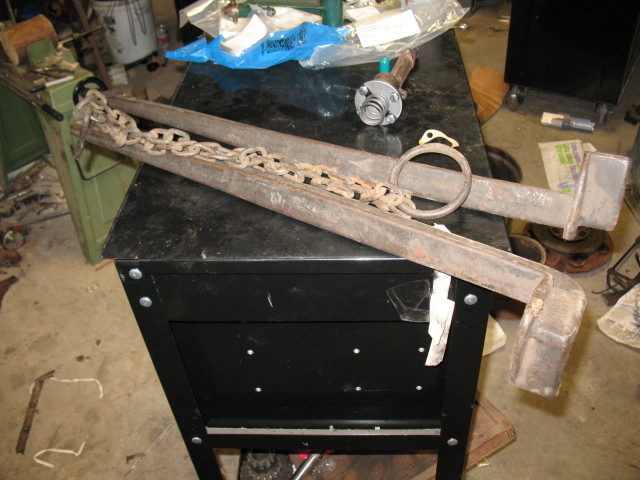 The arm's I used, thick angle iron but not very wide, and the eye's for the chain I used heavy eye bolts, and welded them in the corners of the angle iron. It always makes me wonder when there is a easy way to do something that people will look for a harder or less safe way to do it. Guess I should show how to lift the front too. And how about to pickup the engine? Decide on two (2) good and safe ways of supporting a vehicle that you intend to work under, and use 'em BOTH ! That way, if one fails (or you inadvertently "disturb" one in a fit of anger due to rusted nuts/bolts, etc.) with two (2) means of support, at least one will save yer' a$$ !!! That's also been my policy Harold. My work shop is too far from the house for me to holler for help so caution is the word. Mr Hatch, what would it take to just make you go away, and Quite causing ENVY!!!!!!!!! !